Purchases - SUI Solutions. FileMaker Templates. Professional Software Development for FileMaker. 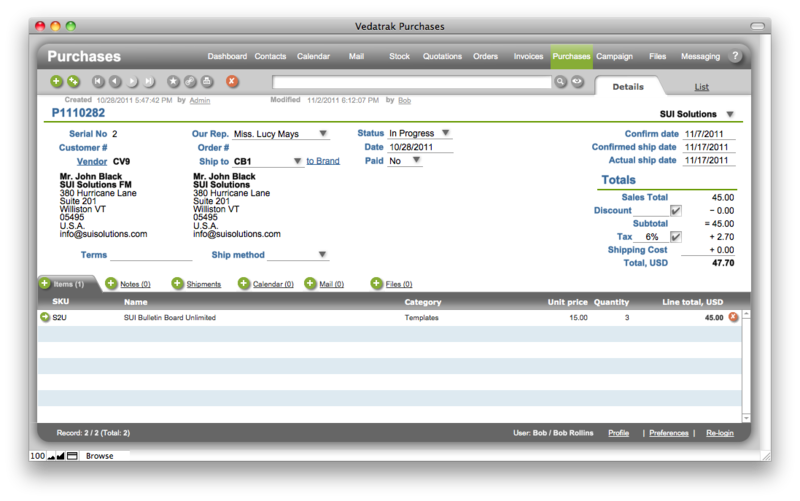 Vedatrak Purchases module supports the sales process by tracking purchase orders history and organizing data for each purchase, including associated vendor prices and shipments tracking. All Purchase Orders are linked to the corresponding products and can be easily found within the product’s card. This feature allows you to get tracking info of largest logistical companies using packages tracking number only. Just enter number and company name (FedEx, UPS or DHL) and click the “Track” button.